I love flavoring muffins with jams and fruity yogurts because I almost always have both on hand. This recipe is easily changed to suit whatever is in your cupboard or refrigerator, with or without the addition of extra fruit. A couple of weeks back, I made a normal blueberry muffin. Some cinnamon, a beige batter, a dusting of powdered sugar – simple but lovely. This week, with our ingredient of choice actually being blueberries, I knew I had to kick it up a notch or two. Make it the blueberriest possible. So, I stirred in some blueberry jam, blueberry yogurt and whole blueberries. Which left me with a distinctly purple batter. As I browsed through my embarrassingly large collection of paper muffin cups, the Halloween ones seemed like the perfect match. So then I had to change the name from Blueberriest Muffins to Triple Booberry Muffins. Yeah, I know. Corny. 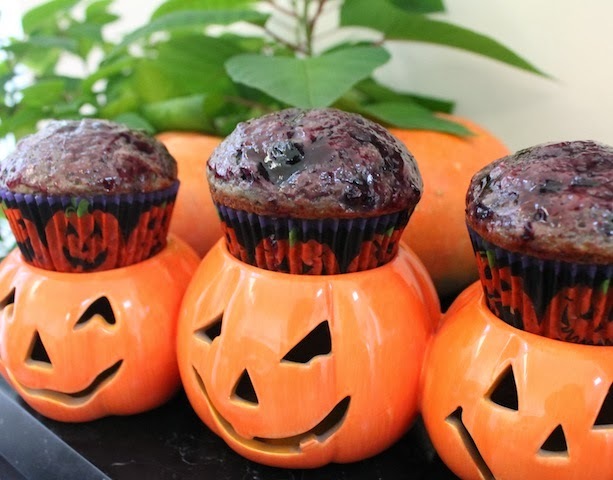 But if you are looking for a relatively healthy addition to your Halloween party table, these babies are it! Preheat your oven to 350°F or 180°C and prepare your 12-cup muffin tin by greasing it or lining it with muffin papers. In a large mixing bowl, combine your flour, sugar, salt, baking powder and baking soda. In another smaller bowl, whisk together your eggs, blueberry yogurt, blueberry jam and oil. Pour your wet mixture into the dry ingredients and stir until they are just combined. There should be some dry flour still showing. Check out that deep purple! Fold in the whole blueberries. Okay, so it's not a pretty color - but the taste! Blueberrilicious! Bake for about 20-25 minutes or until a toothpick comes out clean when inserted in the middle. It’s hard to see when a purplish blue muffin is golden so the toothpick test is best. Remove from the oven and allow to cool for a few minutes. Remove the muffins from the pan and cool further on a wire rack. If you want to glaze them, stir your extra jam around to loosen it a little bit and then brush it on your muffins while they are still slightly warm. Wowee! Those are some blue muffins - but they look delish. I especially love the little candle holders you have them sitting on! This is a muffin for your mother. So beautiful too! Yay! You figured out how to comment! Love you, Mom! I love that these muffins are purple! So cool! The glaze looks really yummy. Love these ultra blueberry mufiins! 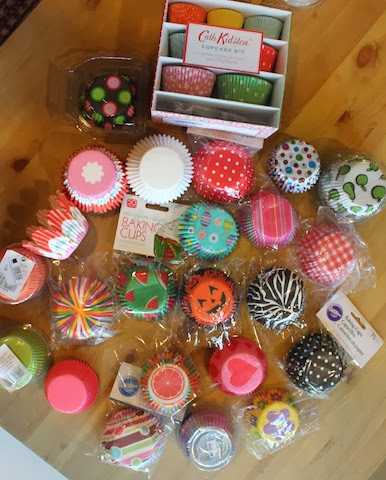 And can I blame you for my new found urge to go shop for cupcake liners?? Oooh, I'd love to see a photo of your collection, Deb. I had those out on the kitchen table because I was trying to figure out how best to store them. They have begun to fall off the shelf where they are currently kept. A plastic bin sounds like a great solution. Thanks, Laura. They were sticky on top and quite delicious. Of course, Liz. I am nothing if not an enabler for any purchase to do with cookbooks, ingredients, pans or paper liners. :) Blame me! I love the "booberry" name, it's not corny at all! And the presentation is awesome, perfect for Halloween. The deep purple of your cupcakes and that sweet sticky glaze is so much fun. I am super jealous of your collection of muffin cups! I'm lucky to find ANY cups around that aren't those stupid aluminum ones. haha. 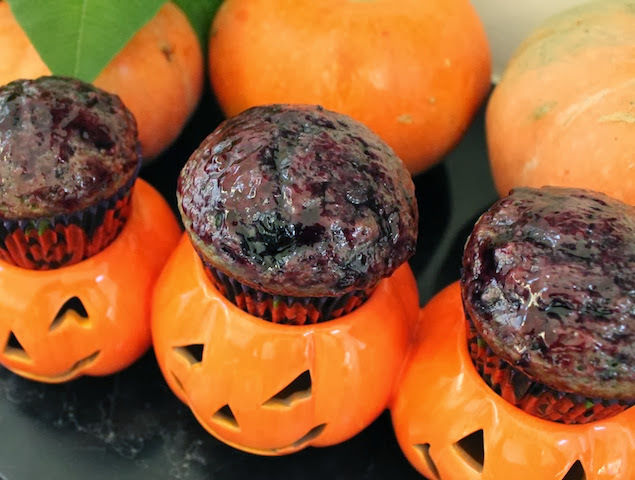 These muffins look perfect for all the blueberry lovers out there! Thanks, Lori. No matter what store I go in, I can't help but mosey past the baking aisle for a look. They are usually pretty inexpensive so the muffin cups are hard to resist. I wish I lived closer, Laura, and I'd take you up on your kind offer. Or maybe you should just start baking muffins. They are so easy, versatile and delicious.